Art – Art classes are an exploration of both 2D and 3D art media. Students explore a variety of famous artists and their styles. Students choose this elective for only one semester in a one-year period. Concert Band – This course is a performance-oriented ensemble of 7th and 8th graders. Students completing two years of Concert band attain competency in rhythm reading in the following meters: 4/4, 2/4, 3/4, 2/2 and 6/8. They experience playing a wide variety of musical styles including hymns and chorales, marches, pop/rock selections, pieces in the classical style (overtures, suites, preludes, etc.) and show tunes. In addition, these students are able to demonstrate master of major scales through 2 flats and 2 sharps. The Concert band becomes a jazz band for two months as students learn that style as well. They attend a jazz concert and perform with either Pioneer or Huron High School’s top bands. CORE – This elective provides extra academic assistance to students in the core areas of math, writing and English, as well as in science and social studies. Organizational assistance with assignments, homework turn-in and studying for tests can be provided as well. This elective is staffed by middle-school teachers of math, English, literature and science. Spanish assistance will be available in the M-W-F CORE class. Drama – Students develop basic acting skills as they prepare a production, which is given near the end of the semester. This semester-long elective requires regular skill-building homework and some after-school rehearsals. Drama can only be selected once a year. Musical Theater – Students develop basic acting, singing and dancing skills that prepare them for performances in Musical Theater. Practice at home and some after-school rehearsals are expected due to performance demands. This is a semester-long elective. Health & Nutrition – In this elective, students learn basic nutrition and health needs for their age group as well as those in the future. They work to develop a personalized health plan including physical exercise and healthy cooking. Students also explore recipe alternatives for favorite foods in the school kitchen. 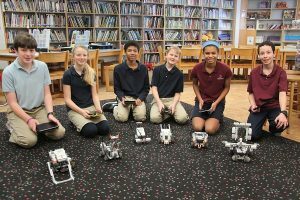 Robotics – Students learn how to build LEGO© vehicles best suited to successfully complete challenges of varying difficulty. They use RoboLab software to create and download programs that will enable their LEGO© vehicles to accomplish assigned tasks. 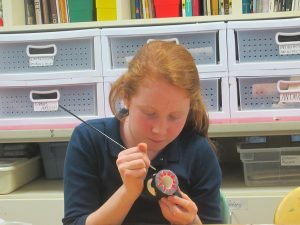 Science Lab Experience – This elective enables students to care for and nurture the various animals and plants found in the St. Francis School Science Lab. While studying living things on campus, students will spend time out in the schoolyard habitat and emphasize animal classification in the lab. Yearbook – Yearbook is only offered the first three quarters of the school year. The first-semester staff will make decisions regarding the theme and design of the book. The third-quarter staff will complete the work needed to meet the publisher’s deadline. All work is done electronically.